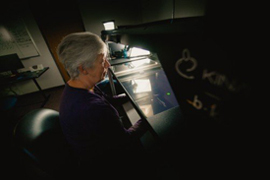 A new project in collaboration with UP Health System Portage investigates how technology can assist doctors in earlier diagnosis of Alzheimer's disease. Alzheimer's is the most common form of dementia. The US Centers for Disease Control and Prevention reports as many as five million Americans had the disease in 2013. They estimate that by 2050, nearly 14 million will have it. Age is the best-known risk factor and memory loss is at the forefront of symptoms. While many think of the progression of Alzheimer's mostly as a cognitive process, the mind and body are inherently linked. A new three-year project at Michigan Technological University, funded by the National Institutes of Health, explores that link. "There is an intimate link between motor behavior and cognitive function, especially as we get older," Trewartha says, explaining that when a person starts a physical task they've never done before, specific parts of their brain kick in. "That early part of learning a novel skill is where cognitive abilities are particularly important." The challenge in studying Alzheimer's is that the symptoms doctors examine and use to diagnosis patients focus on cognitive abilities and neurological functioning. Trewartha and his collaborators have found changes in motor skills as well. But what comes first—cognitive decline or declines in motor behavior? "You can see differences in motor behavior and motor performance that are indicative of cognitive decline and aging, which is true even in individuals who we would say are normal with cognitive and neurological tests," he says. "If we can identify the subtle differences between people who do have Alzheimer's, people who have mild cognitive impairment and people who are just healthy older adults, then hopefully that will allow us to demonstrate that it's important to add these tests to the current diagnostic procedures that are used in the clinic." To help with the screenings, Trewartha and his team need a robot. Specifically, a Kinarm End-Point Lab that looks like a seated voting booth with handles. When a participant sits down and holds onto the handles, a virtual reality display of objects appears in front of them. By shifting the handles, they can try to reach for the objects. In a test called a force field adaptation task, the robot pushes back against the participant's hands and they have to relearn how to change the pressure of their grip to reach the objects. 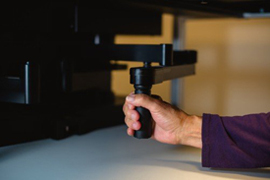 Handles on the robot provide feedback to participants, challenging them to learn a different way to move a virtual reality cursor on a screen in front of them. In another test, called a visuomotor rotation, a cursor representing the participant's hand moves off in a different direction than expected. When reaching to the right, the cursor might move left instead. Again, the participant needs to adjust and relearn how to move their hand when the visual feedback veers off. The two tests engage slightly different cognitive abilities. "The benefit is that they're tasks you would never do in real life; we're taking a task that is completely novel so that we can truly assess that early stage of how people approach learning a new skill," Trewartha says. "We can measure performance over time—from trial to trial—to measure how people learn from the errors they produce." The team plans to work with UP Portage Health to recruit about 100 participants, focusing on three groups: patients diagnosed with Alzheimer's, patients with mild cognitive impairment—a high risk factor for Alzheimer's—and healthy older adults. The study participants will complete one of the two tests, then follow up and repeat it 24 hours later to gauge their memory and skill retention. "If we can show that this is successful in terms of the diagnostic approach, then we need to develop a test that is easily administered by clinicians. The force field task can't be—people won't likely have the equipment, it's expensive, it's technically complicated," he says. "What's nice about visuomotor rotation is that you can design one for a smartphone or tablet." Perhaps one day, worried patients and their loved ones won't have to wait until they feel their memory slipping. Screening early for Alzheimer's could be as simple as a phone game—a tech-enhanced window into the subtle influences between mind and body.